Pioneering discoveries can come in tiny packages, and only few know this better than Ann-Marie Broome, Ph.D., who thinks nanotechnology is the future of the medical field with its capability to distribute potent drugs in small, designer packages. Her recent research revealed the ideal application - targeting tumor cells in the brain. According to her latest paper, published in the international online journal Nanomedicine - Future Medicine, lipid nanocarriers could be targeted to deliver a chemotherapeutic drug more effectively to the brain’s tumor cells if it was engineered to be minute enough to cross the blood-brain barrier. In vivo studies demonstrated specific uptake and increased destruction within glial cells, to the extent that Broome at first questioned the results. “I was very surprised by how efficiently and well it worked once we got the nanocarrier to those cells,” Broome said, elucidating that the earlier results were so hopeful that she made her group to keep on redoing the experiments, using diverse cell lines, treatment times, and dosage amounts. Scientists and clinicians alike are thrilled, as the study potentially indicates another treatment option for patients with specific conditions, like glioblastoma multiforme (GBM), the focus of this work. Glioblastoma multiforme is a destructive disease with no curative choices because of several difficulties, said Broome, the Director of Molecular Imaging of the Medical University of South Carolina’s Center for Biomedical Imaging and Director of Small Animal Imaging of Hollings Cancer Center. The brain tumor has an overall significant mortality, partly because of its location, surgical treatment difficulty, and the incapability to transport drugs through the blood-brain barrier, which is a defensive barrier designed to keep a steady environment within and close to the brain. Conventional treatments would extend life expectancy up to 4 -7 months in 40% of cases. It’s really a dismal outcome. There are better ways to deliver standard of care. That is when Broome came into the picture with her nanotechnology lab. Nanotechnology is the combination of medicine, engineering, chemistry, and biology, and is conducted at the nanoscale, in the range of 1 to 1,000 nm. For an comparision, a thin newspaper page is around 100,000 nm thick. Broome and her group made use of what they knew about the biology of cancer and of platelet-derived growth factor (PDGF), one of the various growth factor proteins that controls cell growth and division and is over expressed on the brain’s tumor cells as well. Keeping that in mind, they engineered a phospholipid nanocarrier micelle, “a bit of fat globule,” to transport the chemotherapy drug temozolomide (TMZ) with a concentrated dose to the GBM tumor cells. Micelles of a certain size will cross the blood-brain barrier carrying a concentrated amount of TMZ. The PDGF is used much like a postal address. The micelle gets it to the street, and the PDGF gets it to the house. This targeting ability is significant because scientists have learnt that it is probable that the GBM will reappear, she said. Incredibly, nanotechnology is a part of our life in various ways that people are unaware of. It is utilized in everything right from makeup as in moisturizers or UV sunscreens to ice cream in order to sustain frozen temperatures and creamy textures. As soon as the package reaches its destination, nanotechnologists have numerous ways to make the micelles deliver their payloads - one method is to use the acidic nature of a fast growing tumor. During normal circulation, the pH of blood is somewhat alkaline and the micelle does not get damaged. Scientists have found that in various tumor types, the pH changes drastically to an acidic environment. While the tumor is growing, it creates waste by-products and metabolites that alter the pH, thus lowering it. As the center becomes more necrotic, it becomes even more acidic. This alteration in pH triggers a discharge of the drug from micelles to the location where clinicians want it to be transported to decrease toxicity to the remaining body, she said. That is the reason why nanotechnology has an edge in shaping cancer treatments in the future. It’s very important that the public recognize that nanotechnology is the future. It impacts so many different fields. It has a clear impact on cancer biology and potentially has an impact on cancers that are inaccessible, untreatable, undruggable - that in normal circumstances are ultimately a death knell. 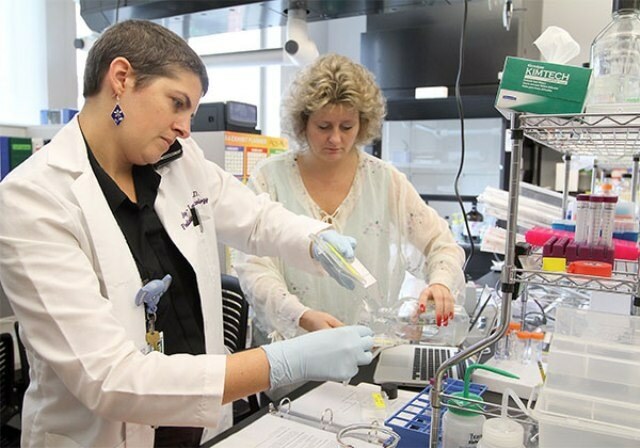 Researcher and clinician Amy Lee Bredlau, M.D., Director of MUSC Health’s Pediatric Brain Tumor Program, was also a part of the study and was familiar with this. Broome said she was happy having the perspective of a clinician in the lab to motivate the team on translational results for the patients. Bredlau said that she is taking time out from her clinical practice to be in Broome’s research lab as she knows that is how she can speed up the process best. According to Bredlau nanotechnology has the power to revolutionize brain tumor treatments. When we perfect this strategy, we will be able to deliver potent chemotherapies only to the area that needs them. This will dramatically improve our cure rates while cutting out a huge portion of our side effects from chemotherapy. Imagine a world where a cancer diagnosis not only was not life-threatening, but also did not mean that you would be tired, nauseated or lose your hair. Though thrilled by the research’s results, Broome explains that there is lot more work to be completed before new options are readily available for the treatment of patients. They will be researching on a growing field of targeted biomarkers, which are available for GBM tumor cells. Similar to breast cancer and other cancer types, this cancer has specific overexpressed cell surface receptors, she said. This drug delivery method also opens a new arena towards immunotherapy treatments gathering recognition at the international level. Broome wants to combine chemotherapeutics with new immuno-therapeutic treatments and form an exclusive delivery package combination. It is ambitious. Broome, whose group often jokes that she keeps “a long, running list of impossible tasks,” said the work also translates applies to many other fields apart from cancer including transplant, stroke and regenerative medicine, where it can be used like in wound healing in dermatology or organ maintenance in transplantation. It is the sole reason she submitted her recent research to an international journal as she wants to increase the advances in nanotechnology, a field she feels will transform how medicine is done beyond a doubt. They are the primary reason I continue to do what I do. They give me hope. The possibilities for nanotherapeutics are endless and bright.